(LONDON, Ont.) — Canada feels good. Everyone who has waited on me or given me directions or been my bus driver has been unwaveringly friendly. At the moment, I’m parked in a driveway belonging to a wonderfully sweet and open woman named Kerri-Anne. I met her through a passing acquaintance, and though she doesn’t know me from Adam, she has cooked me dinner a few times, bought me lunch and showed me around. I feel so lucky, and I’m already starting to settle into the comfort of being taken care of. I don’t really want to give that up yet (though I will tomorrow or the next day). I like it here at her house and in London itself. The town is big (more than 300,000) and urbane with lots of trees and a free art museum downtown. Not having been in a city since Christmas, I feel like a bush woman, intimidated and fascinated by the bustle around me. If only getting into the country had felt this effortless. Niagara Falls, from the Canada side. I’m not the kind of person who complains about airport security or random DUI checks on the road. In truth, part of me enjoys the dip into extreme formality, which I know sounds strange. It’s like, for a moment, who I am and what I am doesn’t matter, as all I am is someone who is not harboring drugs or alcohol or a nail file. It’s weirdly validating. Crossing the Canadian border, however, is a completely different beast. It became an existential query, really, and I was not ready for it. 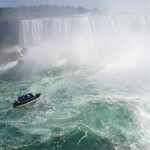 As I waited to enter the country near Niagara Falls, I was listening to music with the windows rolled down and smiling, thinking that this would be kind of fun. Ha. I had no good answers to these questions, asked by a 40-ish border patrol agent with short, blond hair. After saying I was traveling and that I was a freelance journalist, she gave me a small card and directed me to a building filled with fellow suspicious folks. The staff inside was deadly serious but had that distinctive north-of-the-border lilt, which also made them slightly adorable. Part of me was scared of the young guy with dark eyes and delicate features who looked me over and grilled me on who I knew in Canada and what on earth I planned to do there. Part of me wanted to pinch his cheeks. The same went for the middle-aged fellow in the corner who resembled Garrison Keillor and the perky, tow-headed girl who searched my trailer. I don’t mean disrespect, but that dialect is endearing and makes me smile like an idiot, and that response is hard to contain. I had to force myself to take the young, female agent seriously when she chirped that I should “stay on the medium for your safety and mine,” but the moment she started looking through my stuff, I got uneasy. I’m no terrorist, but the mess in my trailer probably made me look a little scruffy around the edges (the place had been sloshing around for a few hours, and papers, drawers and dirty clothes had been thrown around in there). Maybe appearing low-rent was enough to be barred from Canada’s pristine confines. Maybe they thought I was a drug dealer. Maybe I just looked like a lost soul, some West Coast hippie who wanted to drop out of American culture and never return. Even if she thought that, she let me through in the end and didn’t even confiscate my raw hamburger or baby carrots. I drove away a much more sobered individual. 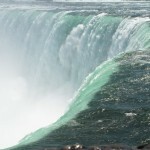 Half an hour later, I was standing at Niagara’s precipice, and I was entranced by the image of blue-green water rushing over the deep drop. I tried to soak that vision into my brain, my heart, but I knew it would start to slip away the moment I turned from the water to catch the shuttle back to my trailer. And it has. That stuff is ephemeral. I can’t remember exactly what it felt like to have the waterfalls’ mist hitting my face, much like I can’t completely put to words what it was like to see the Grand Canyon for the first time or the Pacific Ocean for the last time. I can, however, go back easily to the shame and anxiety I felt as that girl guard sifted through my little house and her male counterpart tried to gauge exactly what my deal was. That kind of embarrassment and nervous rush is strangely so much easier to hold onto. Those memories make me all the more grateful to be in London right now, parked in a level spot with nice people around me. I am trying to soak up all these good vibes while I can. Who knows what it will be like trying to get back into America? Peter and I totally had the same experience a the border crossing in Detroit. We were also on an open-ended road trip with a car full of camping gear, no jobs, no residence and no plans. I think the only thing that saved us was our stack of hostel guides and maps. It was only divine intervention that stop the border guards from find the weed and mushrooms hidden in Peter’s underwear packed in his bag. (Just for him, not me.) The mushrooms were promptly tossed from the bridge as we were let into the country.